The soft, low velocity spray produced by ultrasonic nozzle spray shaping systems often requires air shaping in order to meet the needs of an application, particularly where high precision of uniform deposition is required. Several patented air shaping technologies have been developed by Sono-Tek to shape the atomized spray into defined patterns that can be precisely controlled using low-pressure air to entrain the atomized spray. 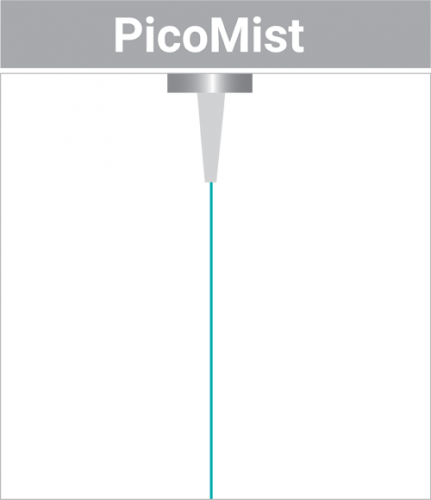 The PicoMist system is designed to produce repeatable fine lines as thin as 0.5mm. Low pressure air/gas is used to focus the spray into very thin lines in very low volume applications. PicoMist creates the thinnest, most sharply defined lines of all Sono-Tek air shaping systems. 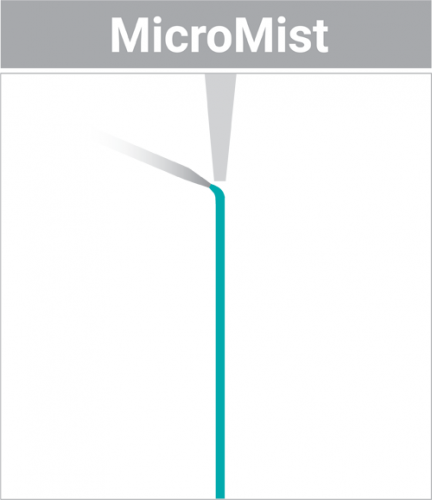 The MicroMist system combines Sono-Tek’s unique focusing ultrasonic atomizing nozzle with low-pressure air/gas to produce a soft, highly focused beam of small spray drops. An isolated hypotube delivers liquid to the nozzle’s atomizing surface while air/gas, delivered through the nozzle orifice at a fixed low pressure, shapes the atomized drops into a very precise, targeted spray beam as thin as 0.020” (0.5 mm) in diameter. 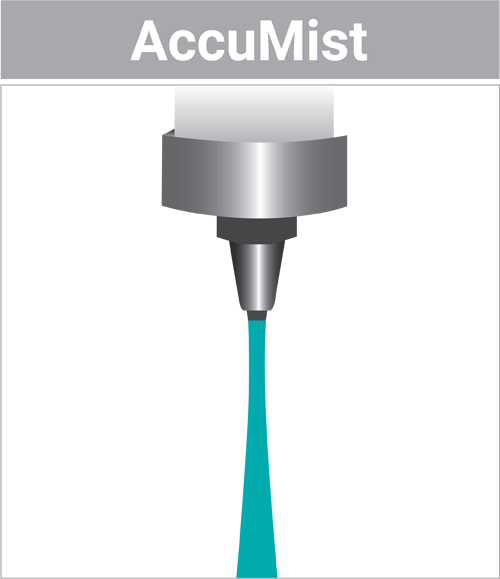 The AccuMist™ system combines Sono-Tek’s unique MicroSpray ultrasonic atomizing nozzle with low-pressure air/gas to produce a soft, highly focused beam of small spray drops. Compressed air/gas, typically at 1 psi, is introduced into the diffusion chamber of an air shroud, which surrounds the nozzle, producing a uniformly distributed flow of air/gas around the nozzle stem. The ultrasonically produced spray at the tip of the stem is immediately entrained in the low pressure air/gas stream. An adjustable focusing mechanism on the air shroud allows complete control of spray width. The spray envelope is very narrow and hourglass-shaped. The width of the shape is controlled by adjusting the nozzle distance to the substrate and varies from 0.070 – 1.0 inches (1.78 – 25 mm). The Vortex nozzle produces an intermediate width spray pattern, wider than the AccuMist nozzle but narrower than the WideTrack spray pattern. The vortex nozzle uses low velocity, rotational air/gas to produce a wide, stable spray pattern. 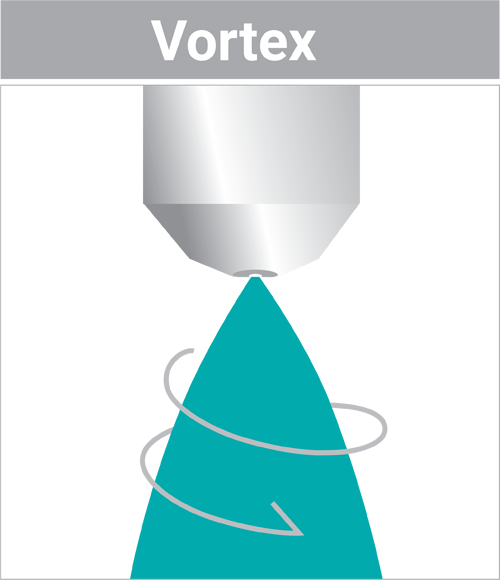 The Vortex nozzle produces a conical spray pattern that is 2 – 4” (50 – 100 mm) in diameter, depending on distance to the substrate. The vortexing velocity can be varied depending on the application. 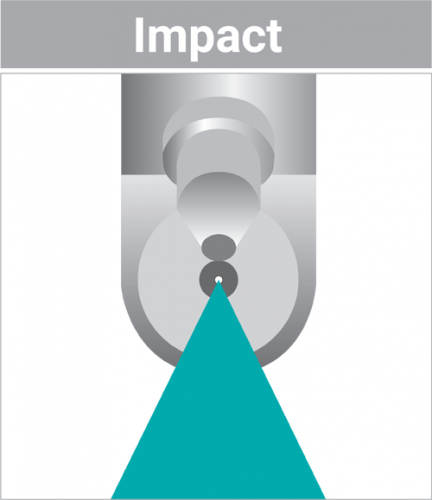 The Impact System combines Sono-Tek’s ultrasonic atomizing nozzle with a controlled jet of air from the flat jet air deflector. The atomized spray is immediately entrained in the air stream at the nozzle’s atomizing surface, creating a fan-shaped spray pattern. The velocity of the air stream is controllable, allowing low or high-impact of the atomized spray onto the product or substrate. This versatile air shaping system is capable of spray patterns up to 6″ (15 cm), depending on distance to the substrate, with unlimited widths possible in wide area applications where multiple nozzles are used in tandem. 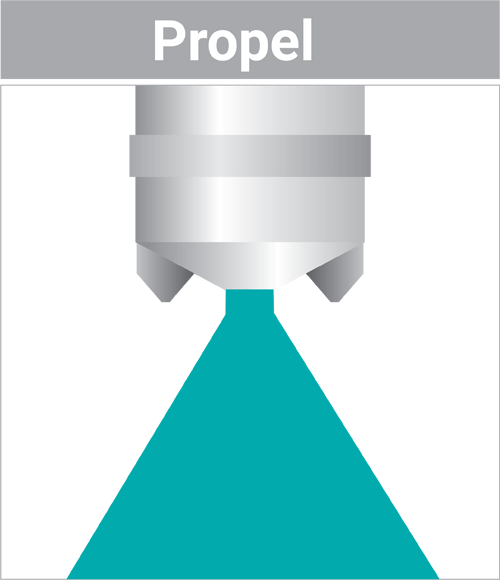 The Propel nozzle uses low pressure air/gas to create a uniform, wide spray pattern up to 9.8″ (25 cm) per nozzle, depending on distance to the substrate. The velocity of the air stream is controllable, allowing low or high impact of the atomized spray onto the product or substrate. 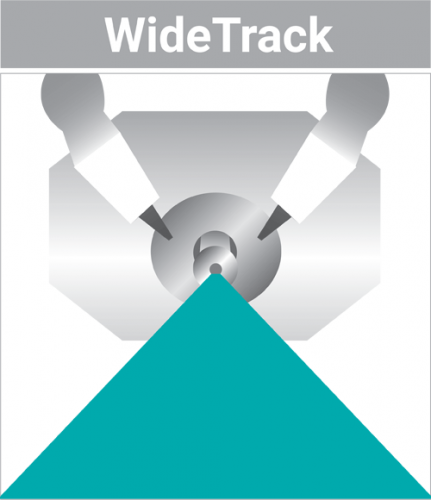 Unlimited widths can be achieved using several nozzles in tandem. The Propel nozzle is designed for highly repeatable wide width patterns in a slim profile nozzle. In applications requiring wide width spray patterns, low velocity air/gas is introduced to shape the atomized spray. A precision jet block houses the nozzle. Two jets of air/gas that pulse alternately to direct the spray as it emerges from the nozzle. The position of the jets can be adjusted, creating a pattern up to 24” wide with a single nozzle. By combining several spray assemblies, a uniform spray pattern of any width can be achieved in either spray-up or spray-down configurations.